Hi, my name is Wesley and how are you doing? I’m a guy who writes about comics on the internet, I’ve written for a few sites, and still love talking about it on social media all the same. I’m usually optimistic and I have my cranky moments but overall I’m a positive person. Lately, I’ve felt that we need more love in the comics internet scene. I’ve interacted with writers from many different sites over the years comics wise. I’ve interacted with many writers, artists, and so forth over the years comic book wise. When I first started I really had no idea what I was doing, all I knew was I liked comics and liked talking about them. Then writing about them happened and then it ballooned from there into a decent sized writing adventure. The one thing is even at points where I’ve not been exactly positive about certain aspects of a comic or what’s going on with them, I’ve still always really enjoyed comics. It was all about to me the conversations and the energy behind them. Nowadays at points it seems that there’s a level of cynicism that appears within the comics community like no other and it makes me sad. Yet at my core I am a generally positive person which makes me the rare breed of a Comic Book Optimist. I’ve had my moments of negativity over the years like anyone else yet I like keeping things on a positive level, an active energy of love in everything I write about. It’s why I’ve been writing the way I have and how I look at books now. Sometimes I think I may started to mellow as I’ve gotten older but it is more along the lines of if I dislike a book now, I really have to find something major that sparks my ire so to speak. Say with ANAD Marvel right now, there’s been a lot of solid books and only a couple that left me kind of lukewarm but that’s really it. DC Comics wise, I’ve found a lot of cool books but still part of the line is kind of okay and that’s about it. Yet I know that there’s a lot of things that need to be fixed but I feel that in time they will be. It’ll take awhile but we’re getting there slowly but surely. Every time I see something that could potentially turn out to be awful, it somehow ends up being better in the end. Hence why I never quite lose my internal optimism for comics. 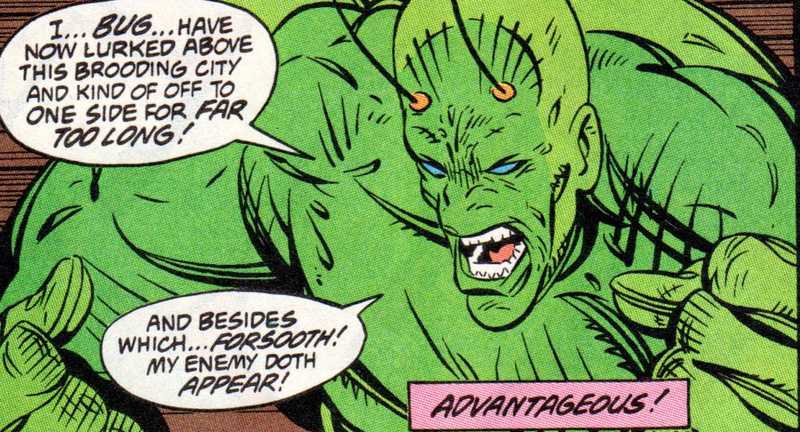 Hence why the Ambush Bug, as Ambush Bug is one of my ultimate in fun characters that I always find myself relating to. Fourth wall breaking madness but filled with everlasting comic book goodness, Ambush Bug in a nutshell. I remember I used to use a fourth wall breaking end line for my columns at Comics Crux at one point. Some goofy thing but really I am a guy who looks at fun in comics and tries to find it in everything. It’s tough to be a comic book optimist and find the good in anything and yet somehow I usually can find something. It was lost to me for a short time but I’ve got it back now and I don’t plan on losing it. It’s also why I put in that you’re all cool with me because you’re all cool with me. My chats on twitter about how I am is pretty much this post, you are all awesome and you’re all why I am such a comic book optimist, the fan base of comics encourages me more than discourages me at this point. Seeing all the awesome creator owned projects out there and what people are doing on the independent scene of comics, that’s exciting and amazing to behold. I still haven’t discovered all of it yet but what I have seen blows my mind and makes me look forward to seeing what will be happening next in comics. Heck when Marvel and DC are trying out a lot of things lately even with stumbling blocks, that’s interesting to me and that has my eyes curious as to what will be coming. It’s pretty awesome on the comic scene right now, not even going to kid you, it’s a pretty wild and fun period of time. I see the comic book TV scene and I’m blown away from what I’ve seen on it, then the comics do that much more and it makes me an even more engaged writer than ever before, I look forward to talking comics more and more lately. Welcome to the most unique period of time to ever be a comic book fan. Ridiculous amounts of new material like nothing we’ve ever seen before, new ideas, new worlds, and more new things being tried than ever before. The fanbase is more engaged, the conversations overall more productive, and we are starting to get somewhere. Hence why I have fully embraced being a Comic Book Optimist. It’d be hard to break me of it at this point. Like I said things aren’t perfect right now on the comic book scene but my goodness it is ten times better than it used to be that’s for darned sure. Yeah we live in amazing times and I’m pretty curious to see where we end up in comics in the coming years. New genre explorations from new and old creators, the bigger companies trying out stuff and seeing what happens, and so many other interesting things happening. It is why I still love wandering about on twitter, facebook, and more and seeing what else is out there and what will be created next. Even the digital platforms have opened up new and exciting possibilities for creators to get their name out there. This is one amazing and unique time to be a comic fan. I want to know how you feel about comic books nowadays, optimistic, pessimistic, bring it on as I want to know what you all think out there about comics and more lately. Whatever the case may be, your opinion either optimistic or not, isn’t wrong by any means. This is definitely one of my favorite periods to be a comic fan that’s for sure. I still can’t believe what I’ve seen so far in the industry that is more good than bad. Oh yes there is still bad but there is so much more good out there. That my friends is the life of a Comic Book Optimist, I know everything bad and good that is happening. I just know it’ll be better and with time everything will be better than ever before. Today I got a weird idea. A really strange and weird idea. As Brian Michael Bendis started to rise through the ranks at Marvel I was a little hit or miss on the guy. Then he took over Avengers and I became way more miss along with many other people in the comic store I used to go to. Oh my goodness was I ever one of those that ranted about along with others of the period. It’s why I trended towards DC Comics for a long time as well and didn’t tread far into Marvel waters for a good period of time. In recent years I’ve started to dig more of what Bendis has done on Avengers and other books. I’ve found myself becoming a fan of his and now I’m looking back on his first story with the team, Avengers #500-503 and Avengers Finale or better knwon as Avengers Disassembled and the Epilogue. This was a story that really left Bendis and I at odds as again, this was a series that had gotten close to me so I barely could give it a chance. Now with a much more mellowed state of mind I looked at it again. It’s not perfect but now I have a different look at it. This story may have broken the Avengers back then but in Disassembling the Avengers, Brian Michael Bendis ended up setting the foundation to make the Avengers better than ever. When Bendis first did Avengers Disassembled the sales on the series weren’t what they are nowadays. Back in June 2004 it was #25 with 57,085 books sold. Which isn’t too bad but probably not the numbers Marvel wanted for The Avengers. Which means Bendis comes in and sometimes you have to break a few eggs to make things better in the long term. Boy did he break a few eggs. Some of the deaths could have been handled better, Scott Lang got annihilated by a revived Jack of Hearts, Hawkeye got a weird death fighting The Kree, and Vision got ripped apart by She-Hulk. Add in Ultron bots, and Tony Stark getting a weird drunken feeling at a U.N. Conference and destroying Avengers Mansion, yeah he broke things pretty handily. Though I did enjoy David Finch’s work on this overall, the Vision getting ripped apart by She-Hulk in full rage mode was a powerful visual. I remember people being so mad about all of this, I remember it well. I remember the reveal of all the chaos with The Avengers being caused by The Scarlet Witch, I’ll say that it was an insane twist. She had been around so long and through so many versions of the team, even on the West Coast Avengers, and no one would ever expect the villain to be her. It’s actually heartbreaking when you learn the reason why so she did a lot of damage but it rips your heart out when you learn why she did it. 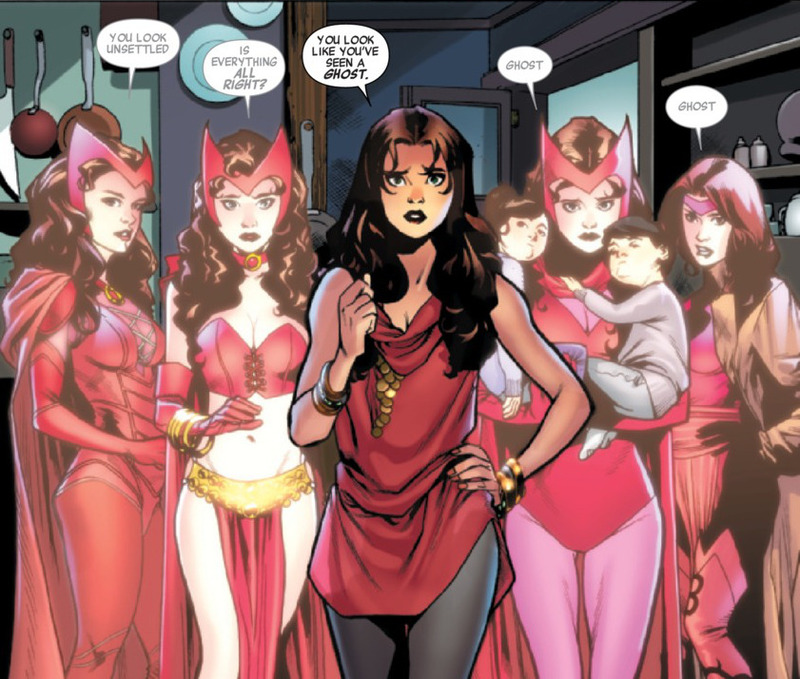 It’s a lot of shock and awe in the coming leading up the Scarlet Witch reveal. At this point though The Avengers were in rough shape anyway so Bendis got leeway to break things apart. I see every single reason why people loved and hated this story. Bendis didn’t hold anything back and wasn’t afraid to kill some darlings in the process. See the fun part about reading this on Marvel Unlimited is how furious people were in the letter pages, they left the letter pages in there. People were not happy at all and they weren’t shy with their feelings. I remember the comic store chats and it did influence me in not giving the book a fair shake or at least a more even handed look. In reading this with a more I guess you’d call it mellowed mind and new eyes, I did enjoy this story even understanding everything that ticked people off. I did enjoy Avengers Finale as it summed up all of the Avengers history in one big story. See I never felt in the entire story that Bendis was disrespectful of the Avengers, far from it as Bendis was showing here that he loves The Avengers. 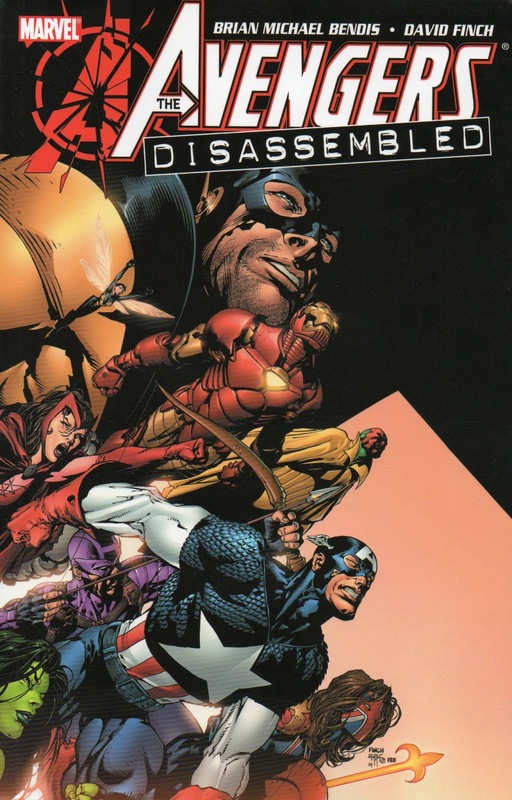 By doing Avengers Disassembled the way he did, he got a lot of interest for the team and by breaking it got to build it into something different. Avengers Mansion was gone and now the team could become something else and Bendis was more or less telling people to hang in there and see what happens. To this day the Bendis run on Avengers is a divisive force among fans of the team. Yet in a way he’s downright reverent to the old teams but he knew to get it into new direction, he had to break a whole lot of eggs to get there. That’s why I’m going to read the entire Bendis run on The Avengers. All of it from cover to cover. I’m going to do it by storyline and by the way, yes there will be spoilers. This is my own personal journey here. Feel free to join me on it, leave a comment, talk to me on twitter, let’s have some fun with this. Avengers Assemble as soon The New Avengers shall rise in my journey through The Bendis Years of the Avengers begins. Here’s the thing about comics, there is truly a comic out there for everyone. Depending on who the person is there is a comic out there for everyone. Yet what does hook someone into a book? This is why I call this Thought Process because there’s no real answer, it’s all depending on the person and it’s a straight forward thought blast. In my own case what got me back into comics was seeing The Avengers and seeing a book with all of them together again piqued my curiosity. It can seriously be as simple as that. I remember when the New 52 hit and that sparked someone into buying all of DC Comics for awhile after only buying Conan books and now he buys all sorts of comics. Nowadays for me it’s a mix of things and it all depends on what it is. Sometimes I have no idea who the writer or artist is but I dig the concept so I’m curious. I’ll give a few examples from my own recent readings. The Shield is one major example, I didn’t know all that much about The Shield but I have loved Archie’s Dark Circle Comics so far. I read the book tonight and loved it to pieces. I mean I really loved it to pieces. To the point where I’m likely putting this on my pull list. Victoria Adams hooked me as a character and I’m intrigued as to how she uses her skills and memories as the series goes on. I knew the barest of bones of a concept and totally fell for the series. I also now need to hunt down Chuck Wendig’s work because I dug the heck out of his writing. So the barest of a concept can pretty much hook someone, no real knowledge of everyone involved, just trust in the quality of the company. So bare bones it was unreal and if you’re curious what cover I got, the movie poster one was amazing. Agents of ATLAS one-shot out of the Secret Wars was a weird one. Right now I am overall burning out hard on Secret Wars yet I love Agents of ATLAS. Not being written by Jeff Parker and not drawn by Leonard Kirk but I do like Tom Taylor and Steve Pugh so hey let’s do this. Read it tonight and totally kept the feel of Parker and Kirk’s work on the series. Ah it was so freaking cool. See what got me hooked into this was love of the team and liking the creative team initially. Then in reading it I really enjoyed it. It’s part of Secret Wars but it’s just a one shot and a fun one-shot at that. Knowing that a comic is just a one-shot can also be a selling point for someone checking in on a favorite concept. Now Invincible Iron Man #2, oh wow I cannot believe I wasn’t a big Brian Michael Bendis fan a few years back. How misguided I was once upon a time, now I can’t get enough of his work. Bendis and David Marquez have such a rocking book. Initially what got me into it was simple, Iron Man, Bendis, Marquez, cool armor design and that the armor uses all the abilities from all the other Iron Man armors. Simple as that and the villains and other surprises in this series never ceased to blow me away. I knew what I dug about the comic initially and in reading the first two issues I’m officially hooked on this series. Really this is but three examples of my own that got me hooked into a comic, there’s many more things out there that can get people hooked. I’m curious as to what gets you all hooked into a comic. Let me know in the comments below, twitter, whatever else. Thanks for reading, take care! Warren Ellis on Karnak was what I called the wild card comic. Far and away out of any title this was a big wildcard. It’s also possibly one of my favorite things I’ve seen Ellis do at Marvel up there with Nextwave and his Secret Avengers run. Karnak is brought to life in the best way possible via Warren Ellis. You have a perfect art style with Gerardo Zaffino, amazing colors by Dan Brown suiting the gritty but strangely enjoyable atmosphere this comic has. We’re putting it out there now that I loved this comic. I really loved this comic. The review aspect of this pretty much got incinerated when I was muttering Spider Jerusalem quotes in my head and I knew Karnak was making me really happy. Warren Ellis, Gerardo Zaffino, and Dan Brown really have something here and now I’m going to spend this post having a full blown happy dance about this comic and all the things I love about it. Come join me, seriously, this is the ultimate happy dance post here. If you’ve never read a single Inhuman anything in your life, you’re fine reading Karnak. If you’re just a fan of Warren Ellis you can read Karnak and have a blast. This is the book that I feel out of a lot of the recent Warren Ellis Marvel adventures suits him best. I liked his Moon Knight pretty well but Karnak I totally adore from the first issue. I think it is because Karnak is an easy character to get a handle on. He sees the weakness in all things, he can see the flaws and use them to his advantage. He’s got his Tower of Wisdom and he’s the Magister of it or as explained in the book, the Inhuman title for High Priest. It does reference the Terrigen Mists but I think it does a good enough of a job explaining what the mists did. It is the Karnak show and even better you get fun appearances from Coulson and Simmons, which now makes me want an Agents of S.H.I.E.L.D. book written by Ellis. Extra bonus points for Gerardo Zaffino’s art on this comic. It’s got such a nice feel to it, it’s got a grit to it yet smooth as silk when it counts. Karnak is someone who can feel the room around him and Ellis got a good partner in Zaffino to bring that out. Karnak is the kind of guy who when he enters a room, he knows his place in it. That’s how Zaffino handled him in his art and it was great to see that he could do great work with showing emotions or lack thereof. A great sense of storytelling is at work here as even with the action, it was spot on gorgeous. Dan Brown is also this phenomenal colorist, in a book mostly shaded in darker tones he’s adept with it. You could feel as though you were in an old broken down headquarters. The final page was also a masterwork in popping your eyes out with action and then begging for more, that’s pure art, writing, and coloring merging together to make beautiful music. Yes, Karnak is good and even with Warren Ellis involved I get the feeling no one will know what to make of it. I say though for the Marvel reader and a fan of the Inhumans, you’ll dig it and for the Warren Ellis fan, I am restating this again that you’ll probably dig it too. Warren Ellis is on his A-game with this series. Karnak #1 comes highly recommended by me. Enjoy it. Here’s the thing about Sam Wilson: Captain America, this is a good comic. I bought this in all honesty because I saw D-Man and Misty Knight and was sold and it caught my eye. Daniel Acuna’s art looked the best it has ever looked and even more sold. There is so much good here and then a speech happened in the issue that pretty much set people off. Sam Wilson is going to be a different Captain America than what we’ve had before. He does a speech that divided the Marvel Universe against him and now he’s on a new path. It’s going to be a more political Captain America book and that’s not a bad thing at all. It’s also a new way of showing how Sam Wilson and his team are going to be a bit more low budget. In the vibe of Uncanny Avengers actually, though without the Deadpool Merchandise funding the team angle. Not sure how this team is going to get funding but it is a more daring take on the character. It’s Captain America with a new take on the Marvel Universe and the state of the world. It’s great timing to have Sam Wilson: Captain America hit the way it did, right at the time where we’re on the eve of a crowded and strange Presidential adventure right now with all the candidates we have. Spencer really does a nice job of showing Wilson’s reasoning for going in the direction he does too. It really does fit the times that we are in. Captain America has always had a level of politics to it over the years, Nomad and other stories but this is the most political the character has been in awhile. I really found myself getting into this as between the defined direction of the comic and the fact that this team doesn’t have limitless funds, that’s interesting to me. As a reader I like that this team has a risk to whatever they’re doing and they are taking chances and taking stands. This is a good thing for the book and keeps me personally more engaged with the series long term. Even more cool, Redwing, no matter what Redwing is always great. If you’ve never been quite sold on Sam Wilson as Captain America, read this book. Nick Spencer is going to be doing some great stuff with this character and even better taking Misty Knight, D-Man, and his trusty falcon Redwing along for the ride. Try this and before you look at all the headlines and stuff, read it and it’ll make sense as to why this book is going where it is going. Give it a chance and I think you’ll enjoy it. Right now at this point, I think Sam Wilson is a rocking Captain America and Nick Spencer and Daniel Acuna are a great team to bring his adventures to life. 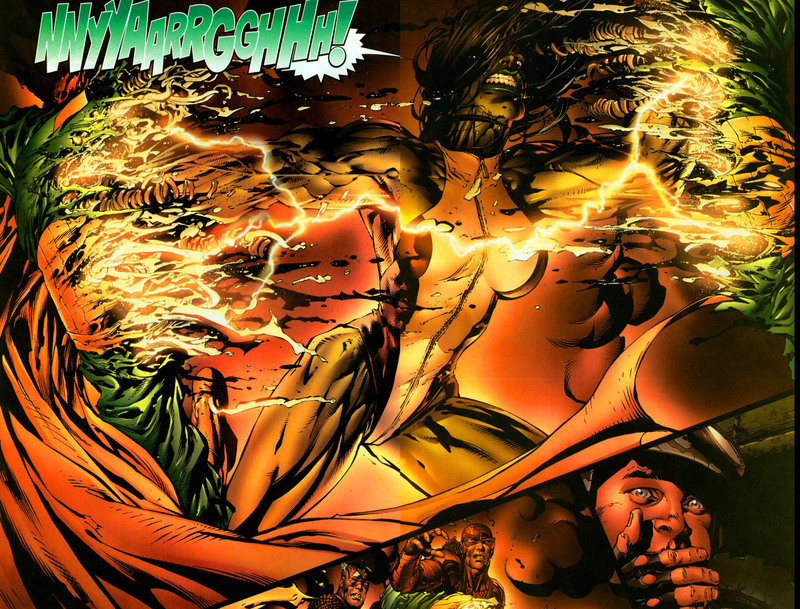 Chill Bloggity Thing for 10/15/15 with Some Quick ANAD Marvel Thoughts! Today has been my day of library, reading, and getting all sorts of cool stuff done for future adventures. Tomorrow will be mostly errands and so on. Even funnier I saw I had a coupon for Half Price Books from my birthday that I had somehow missed. I am as shocked as you are on me somehow missing a coupon for my birthday. Of course it expires on Saturday so hey an excuse for me to visit Half Price Books, oh shucks what a torment to visit a bookstore I would visit anyway. That’s probably going to be tomorrow outside of massive amounts of writing I plan on doing, or at least get in an hour or two of writing or more depending on what the day holds. As I say my Habitica is loving me right now, I am going to have the best set of gear tasking can buy on Habitica at this point. Since I’m also still awake and have a few random thoughts popping into my head with some All-New All-Different Marvel books, I decided to quick blast a few before I go to sleep tonight. As let’s face it these will be short and sweet and I’ll get my random thoughts on them out of my system so here we go! I loved the original miniseries when I read it and that was my initial interest in this series. I didn’t know much about the fighting game until just after reading this issue and downloading the game on my phone. The simple concept of Contest of Champions is it uses Battleworld as a way to unleash different characters from all over the Marvel Universe to battle against one another. Same way as the mobile fighting game. Al Ewing has a lot of fun with this though as you can go nuts with a concept like this. I didn’t expect to like this book as much as I did though because it is a tie-in to a mobile game but is it ever a blast to read. Paco Medina’s art is gorgeous with Juan Vlasco’s inking and has a fitting look to handling the endless atmosphere and different worlds within Contest of Champions. With an impressive coloring job by David Curiel that fits this series well, It’s a solid book. Even if you’re not playing the game you’ll probably find yourself having fun with this book. Wow I really liked this comic a lot. Brian Michael Bendis has been a writer that I’ve been growing to love in recent years. I’m excited for Invincible Iron Man as the new armor being able to use all the powers of any Iron Man armor is so cool. The Armor is slick and dynamic and David Marquez’s art captures that sleek new look. I loved Justin Ponsor’s coloring on this comic book, it’s bright, fun, and brimming with excitement, I’m beyond pleased. Bendis is also doing great character work with Tony himself and building up his new world. It’s a brave new world for Tony Stark and it shows as we have a take on a classic villain coming back into play and a crazy ending that practically begged me to want #2. This is one I am going to be buying on an ongoing basis that’s for sure. I’m going to do a few more tomorrow on Guardians of the Galaxy, Sam Wilson Captain America #1, and Spider-Gwen #1 and go from there. Not sure if they’ll be full columns or just me doing these quick blasts like I am now. Anyway, to bed with me as I’m getting a little sleepy. Take care everyone and hope you all are doing well out there, bye for now! 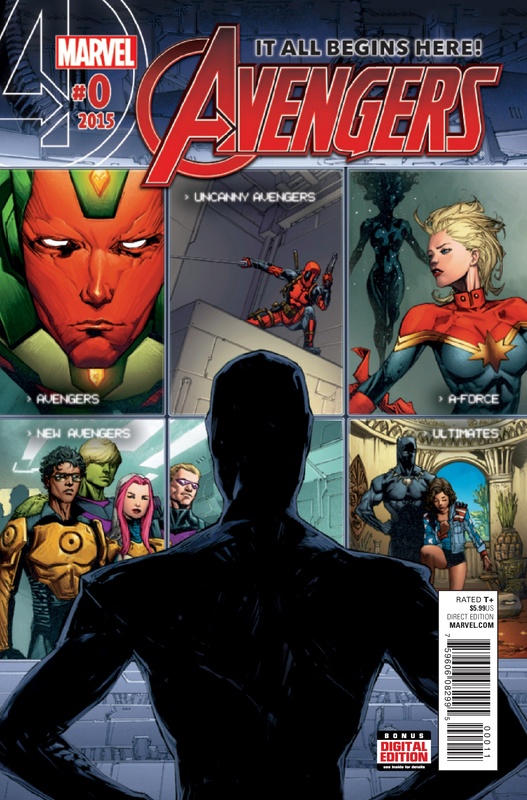 The Avengers for the most part from what we’ve been reading are a much more scaled down crew. The Uncanny Avengers working out of an old theater supported by Deadpool, The Avengers team from the FCBD special not having major funding, but The New Avengers is a whole other ballgame. The New Avengers are the Avengers with a limitless account and full of funding and endless wonder. Welcome to Roberto Da Costa’s (Sunspot) New Avengers team powered by A.I.M once Advanced Idea Mechanics and now Avengers Idea Mechanics. The team is another good mix of the characters joining Sunspot, Wiccan, Hulkling, Hawkeye (Clint Barton), White Tiger, Songbird, Power Man, Squirrel Girl and Tippy-Toe, and POD all make up The New Avengers. They’ve got the money, they’ve got the talent, and now they’re here to do their part to save the world. Al Ewing from the preview I saw is really pressing the concept of them going after villains unlike what we’ve seen before in Marvel. Time to see if The New Avengers really is a new concept and continuing the surprising ANAD winning streak with me or a whammy? Time to find out in my continuing ANAD Marvel Adventures! Let’s get this out of the way for the sake of sanity, the art in this book is a mixed bag of tricks. Gerardo Sandoval’s art fluctuates wildly to really good in the Quinjet panels, to not that great looking in many cases. Out of all the styles so far I’ve seen out of Marvel this one was the one that I was a little concerned about. It wasn’t too bad in the preview story but with a full issue I felt my concerns for the art on this story were sadly justified. I really liked the opening panel on the Quinjet and the later battles in the issue, those looked dynamic and cool as anything I’ve seen and perfect for Sandoval. It’s when the story had to slow down that things fluctuated wildly. Yes kids I noticed the lack of eyeballs too but that didn’t bother me that terribly much, I’ve seen worse. I also have to say the coloring did a number on this book, Dono Sanchez Almara’s coloring was all over the place. At points it looked dark and killed the energy of the book but there were points where it captured the brightness and fun of the concept. It’s a book that demanded a unique and fun style but it doesn’t entirely work in this issue but it could improve. There’s a reason why I started with the art first as bluntly the story here, it rocks, it really does rock. Al Ewing’s concept for the New Avengers is so much fun it is unreal. The team dynamic is great and Sunspot is awesome to see in action as he deals with A.I.M. now being his own force of good and interacting with a justifiably nervous S.H.I.E.L.D., that works. The team interactions all work, Squirrel Girl works especially well in a team setting like this, I’m impressed. Even Reed Richards from The Ultimate Universe works well as a villain here, he’s compelling and his W.H.I.S.P.E.R. organization is a great idea. The moniker of the Maker and his interactions with his underlings are wonderful, I enjoyed it. When the New Avengers are in battle against these weird crystal headed people, it was so strange but delightful as to how they banded together. Ewing has so much happening in this comic and despite any issues I’m having with the art, the story is a blast and so enjoyable. The art is the toughest part of this book while the actual writing and story is heading in the right direction. Should you buy New Avengers #1? If ever there was a place to use the phrase your mileage may vary, this is it. The art is already going to polarize people but the story is engaging enough to keep you into the book. It’s worth trying at least. I’m still unsure if I’m going to continue with it personally as I like the story but the art does hurt it a little. It’s a strange situation to be in, so I’ll put this book as worth trying for this issue to see what you think. 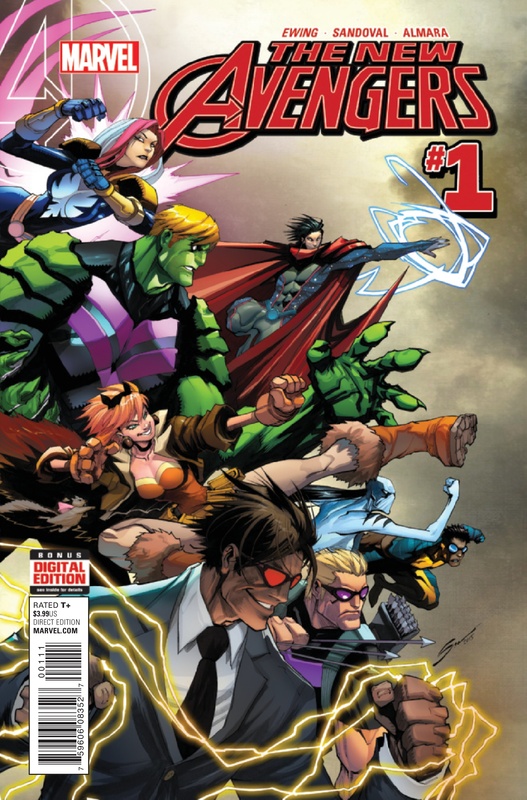 That’s my final verdict on New Avengers #1, great story and polarizing art. Uncanny Avengers #1 out of a lot of ANAD Marvel was one I didn’t find myself that hyped about. I was hit or miss on Uncanny Avengers when it was under Remender’s hand though I loved the first arc, but I decided to give this a shot thanks to the Avengers #0 story. Deadpool as an official Avenger is enough to at least catch my eye. It’s something that you never saw happening ever yet here we are, Deadpool is part of the Avengers. With Steve Rogers at the helm along with Rogue, Johnny Storm, Quicksilver, Spider-Man, Doctor Voodoo, and Synapse we have our Uncanny Avengers. The team make up is called The Unity Squad which is Humans, Mutants, and now Inhumans working together to make the world better. 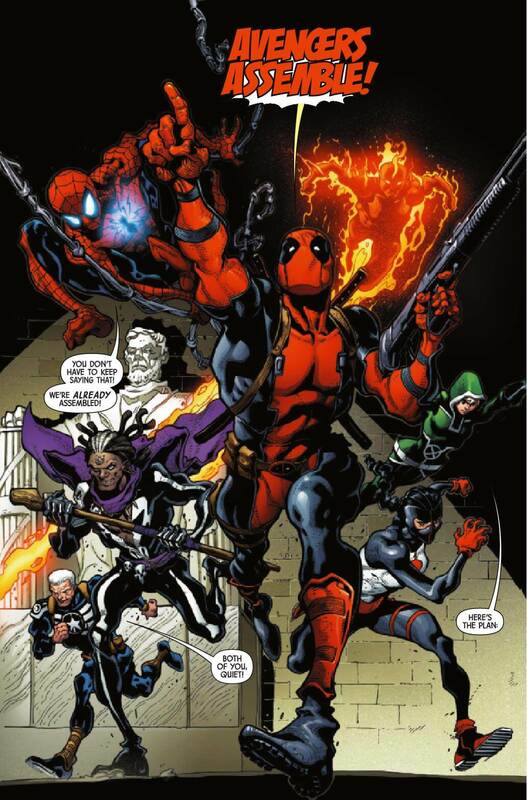 Gerry Duggan who has spent a lot of time with Deadpool in his own series is writing this new team along with Ryan Stegman bringing his artistic talents to the squad. Put Richard Isanove on colors and wow, this comic really pops out at you. From a book I didn’t think I’d end up getting into as much to a series I could see myself reading more of, here’s my own journey through Uncanny Avengers #1. ANAD Marvel, you’re pulling out some surprises on me aren’t you? Initially I titled this with a title referencing the Justice League International mostly because the team dynamic is one of the more stranger I’ve seen in awhile. It’s unconventional but enjoyable in a fun way. I like many types of team dynamics and this is one that I could see becoming a lot of fun in the issues to come. They’re based out of an old theater for goodness sake that has endless amounts of history to it. I’m excited to see where that leads as a theater as old as what the Uncanny Avengers are based out of has character in itself. In a very mild spoiler for the book but not a big deal as it has been shown in previews but Deadpool funds the team. Not a joke, not a lie, Deadpool funds the Uncanny Avengers through merchandise sold at the theater, that’s amazing. I love these little touches that Gerry Duggan has added to this series. Oh yes there is fighting but there is also so much character to this series that I can’t help but enjoy. To me the state of the team in Uncanny Avengers makes sense considering that everything in the Marvel Universe is a little haywire. It’s honestly kind of exciting for me to see how this team plays out. I like Quicksilver in this series as him getting to have some fun and enjoying himself worked for me. I joke that Johnny Storm is the next Wolverine considering he’s on both Uncanny Avengers and Uncanny Inhumans. The new villain is still early in development and I’m not completely sold on it yet but it’s a first villain and a good way to build the team dynamics so I’m game to see where Duggan takes the idea. Even weirder we live in a concept where Deadpool can work well in an Avengers team, I never thought I’d say that but I like this world. I get the feeling some people are going to be torn on Ryan Stegman’s look on this series. 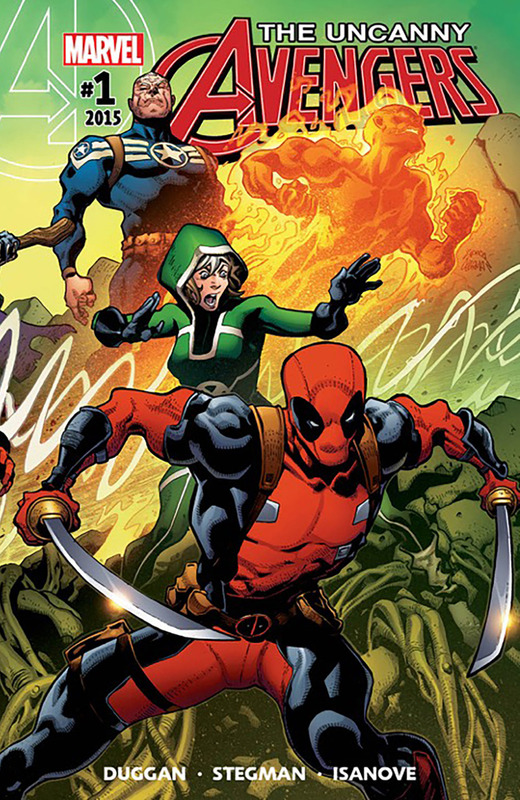 Personally I loved what I saw in the Avengers #0 intro story and it is only getting better in Uncanny Avengers. Steve Rogers has the best grizzled battle look ever, he might be an old man but he shows that this old man can do damage. Duggan’s characterization shows as much as Stegman’s art matches that. It’s also an action packed story which the initial battle with the Super Adaptoid shows off the massive amount of energy Stegman is putting into Duggan’s script. It’s so fast paced and it feels like a thrill ride. I like Stegman’s take on the Adaptoid and really loved how he handled the action of Spider-Man in the battle. Even more the theater pages were also favorites of mine as Doctor Voodoo’s conversations in there, and Steve Rogers giving us a mini tour of the place looked amazing, I love Stegman’s art in showing off the look of the new headquarters. I’m a sucker for cool old buildings and cool theaters and this hit the spot. A comic that has an off kilter style and a team to match it, I’m digging this. Take note of Richard Isanove’s coloring on this comic too, it’s really spot on. Isanove is such a great colorist and every page of this really makes Ryan Stegman shine. I’m going to spotlight the theater though in my favorite bits of the coloring because it has these muted colors showing how run down the place is. Even better that when you go down further into the basement and see the dimly lit atmosphere of the theater and it creates so much atmosphere. Every bit of this book looks great but I especially want to rave about the theater scenes because it is in those quiet moments where a story can really shine. I’m as surprised as you are as to how much I really dug Uncanny Avengers #1. This was one of those I bought as a pure curiosity and found myself getting into the concept. This is one of those moments where giving a comic a fair shake isn’t a bad idea. It’s a cool book and fun team story that has the sort of things that I enjoy in a superhero comic. We need more comic teams based in awesome old theaters anyway. I think a lot of you would get a kick out of it too so give it a shot and see what you think. My buddy Matt Lune from The Awesome Source asked me my thoughts on Avengers #0. The funny part was my comic store didn’t get a box of comics and that box happened to contain Avengers #0. Sadly I couldn’t get my hands on it but I did manage to get it and now I can actually give my thoughts on it. Avengers #0 is Marvel’s way of spotlighting a lot of upcoming series and what will be going into a lot of the upcoming Avengers titles in the process. Marvel is definitely venturing into a lot of new ideas for their universe, redefining old ones, and doing a few things that even surprised me in the process. I read an early review of this book that didn’t say much and I’m glad because I could go into this blind for the most part. It’s cool to see that this actually merges together as a full story and building up more of the state of the All-New All-Different Marvel in the process. I can’t wait to see how this goes over with people as I actually find myself more interested in some books in the process thanks to this. I love how the story is built around the Squadron Supreme and how they’re going to deal with the Avengers. James Robinson getting to be the one to write up this story around the rest of them is a major thing and show that the Squadron are going to be major players in the ANAD Marvel Universe. When I say they’re up to big things, I’m not even joking, this is going in directions I didn’t even fathom. This could be really cool. Through their conversations you start get your explanations for what will be to come in the lives of the different Avengers. There’s going to be a lot of crazy stuff about to go down here. The Vision’s story is heartbreaking. I don’t care who you are but the Vision will break your heart. Mark Waid’s take on the Vision uses the history of the character and all the pain he’s gone through over the years. The way Waid had Vision interacting with his ex Wanda Maximoff a.k.a. The Scarlet Witch are genuine and true. Mahmud Asrar’s emotive art for this rips out your heart and you can’t help but keep reading as Waid’s story is so good. Sonia Oback’s coloring here is top notch and gorgeous, the mood of what the Vision is going through is muted with dark colors. The only light is by the slight candlelight Oback uses in the story, which makes it that much more effective. It’s a great piece and makes you excited to see what Waid and Asrar will do with the Avengers team and what Tom King will do with The Vision in his upcoming series. While the A-Force and Ultimates stories are both done by two teams, they both work together so we’ll cover both of them in the coming paragraphs. First off with the A-Force it is really about Captain Marvel and Alpha Flight, but setting up the basic idea of A-Force to come and the new Captain Marvel ongoing. We’re getting to see how Captain Marvel works with her satellite and Alpha Flight from what I can tell is her support staff which is awesome. G. Willow Wilson really knows how to set up a good story involving a certain character from A-Force in Secret Wars appearing and Captain Marvel wondering what is happening. Then we also get a new character in Tempest Bell working with her and the crew on the Satellite and Wilson has already made her a cool character, I’m excited to see where Tempest Bell goes in the Marvel Universe. I really enjoyed Victor Ibanez’s art as it captured the great action here and the scale of what is happening here in the story. With Laura Martin’s ever amazing coloring, especially with Captain Marvel in action in space with energy blasts flying everywhere and looking spectacular. Now for the Ultimates, wow this book is going to be nuts. This is going to be a powerhouse team. Captain Marvel, Black Panther, The Blue Marvel, Spectrum, and Miss America, but no set up for Galactus yet. The story was about following up the events from the A-Force story but really letting it be known the level of villain the Ultimates will be dealing with. Al Ewing makes it clear that the scale he’s dreaming up for them is out of this world. It was also the chance for Miss America to shine and she’s a lot of fun. If you are unfamiliar with Miss America and don’t immediately dig the heck out of her, I will be shocked. Kenneth Rocafort’s art is not to some people’s liking but I like him more here than I did in Red Hood and The Outlaws. Much smoother layout wise and much improved all around. It gives me hope for the Ultimates and Dan Brown’s coloring is gorgeous, it’s got a lot of flash and dazzle to it that engage you to the large scope of the story ahead. Now I’m much more sold on The Ultimates. Now for Deadpool’s piece here is really Garry Duggan setting up the idea that Deadpool is somehow going to be a freaking Avenger. How does this happen, why is this happening? Well that’s what Duggan does and he does it well. It actually somehow makes sense to see Deadpool as an Avenger. 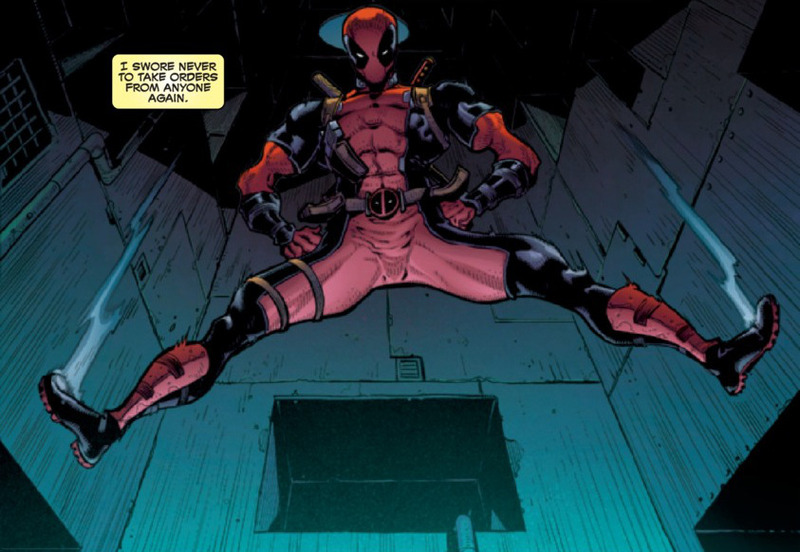 This is a strange place we are in seeing Deadpool in the Uncanny Avengers but hey, I like it. This is weird and Duggan shows the emotion behind Deadpool in the midst of this big thing. Steve Rogers is now having Deadpool run missions with him and it shows the level of respect Deadpool has for Steve Rogers. It’s really fun and a well done story, I now want to at least read the first issue of Uncanny Avengers to see where this goes. Ryan Stegman’s art is also a major selling point here, I’ve always liked his work and this was spot on. It’s fluid, action packed, and has a lot of great detail in capturing the world. Richard Isanove’s coloring is huge here as it is bright and gorgeous really letting Stegman’s art shine. I’m impressed that this worked as well as it did but I’m sold. Well done. Now for New Avengers, this is the off the wall ideas book if I ever heard it. Al Ewing is using this squad to throw Sunspot as head of A.I.M. (Avengers Idea Mechanics) and go nuts. This is the issue as it revolves around setting up a major villain and the concept of New Avengers and what is to come. There really isn’t as much character work here but the new A.I.M. idea was so big that it didn’t need a ton of major character work. It explains what Sunspot is up to and shows the team and here we go. It has an American Kaiju coming up for goodness sake and other bits of madness, I’m pretty sold. The art here is going to be the real tough sell. Gerardo Sandoval is heavily stylized and I can already see the division right off the bat. It took me a minute but I’m digging it and it fits all the madness that Ewing is about to throw at us. High emotion faces, exaggerated action, and lots of imagination, this works to Sandoval’s art. Dono Sanchez Almara’s coloring is pretty solid here, it runs real dark at points and a little muddy but looks good for the most part. New Avengers #1 should be a good time, I’m definitely game to try the first issue out for sure. As for the art on the framing sequences, Leonard Kirk is going to work well on Squadron Supreme and Paul Neary does an excellent job inking him. Frank Martin’s colors were a nice compliment to his art for this story. Believe me the Squadron Supreme are going to be big and if the rest of these books live up to what Avengers #0 set up, wow Marvel is going to have a formidable line up of titles on the way. I’m also impressed I got this large an article out of this but sometimes you have to let the words flow. All-New All-Different Marvel is trying a lot of exciting ideas here and sign me up for the fun ahead. I just got a look at the TV ratings for Tuesday night via TV by the Numbers and it is pretty interesting. It’s cool to see that Agents of SHIELD went up a notch in ratings from last year. I think why Agents of SHIELD went up is the fact that the show is going in a new direction. It’s becoming more like a Marvel movie and feeling more and more like part of the universe outside of the movie tie-in episodes. I did notice the budget got increased more for the opening episode of Agents of SHIELD and I wonder if the budget increase will be there for the entire season. It looked a lot better than it has and this is from someone who’s a fan of the show. It’s always had a decent enough look to it but now it looks much more polished. Even Lash’s appearance looked pretty good, I’m surprised by that. Now the test will be if Agents of SHIELD keeps up these ratings for awhile. As long as the positive buzz keeps up and more people decide to give the show another shot, heck Agents of SHIELD could actually have a highly rated season on its hands. Now in relation to that and everything else ratings wise, well that gets interesting too. See if you look at the ratings you see that pretty much every show on Tuesday night deals with NCIS and NCIS: New Orleans. That’s the ultimate fight that any show on Tuesday night deals with is the NCIS franchise. It grows in viewers year by year and is at this point hard to beat. That any series does a little of what NCIS does it is considered a small victory. Agents of SHIELD got 4.8 million viewers and that’s pretty impressive against NCIS: New Orleans. Now if you say look into The Muppets and it look a little bit of a hit from last week, it’s still doing pretty good against the NCIS powerhouse. Heck that Grandfathered and The Grinder did as well as they did against NCIS is pretty amazing. Screen Queens is going to have a tough future at this point as I’m not sure anyone cares about the show after the initial episode. Yes the Voice is on too and I treat that as the mega event show. It does well when it is there and it can beat NCIS in the 18-49 demographic but in overall viewers it can’t even touch NCIS. The Voice does great but not enough to battle the NCIS powerhouse on Tuesday night. That’s why I say if a show can even do a little leeway in getting past NCIS, you’ve got a small victory on your hands. For Agents of SHIELD it got a victory and a notch in their win column. It’s only going to get crazier from here in the Tuesday Night Battleground.